This is a follow up to my previous post, 500 miles of Bolt ownership. After more time and many more trips, I have learned a few more things that I wanted to share. 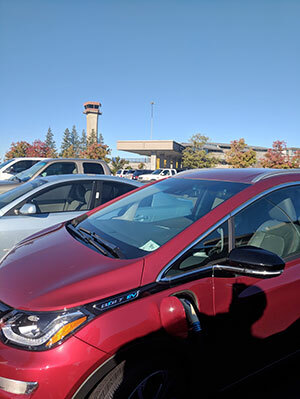 Happiness is actually getting a parking spot at the airport with a charger – this was the first time I won the charger “lottery” at Sacramento Airport! A few months and 10 times as many miles later, I still love my Chevy Bolt. My average efficiency has dropped a bit from my first post, perhaps because the tires were a little lower pressure for a while, or maybe I just stopped being so obsessive about it. It’s still averaging about 3.9 miles / kWh with the vast majority of miles on highway. I can safely and comfortably walk and bike around Davis so I rarely drive in town, but have surprised myself by driving more than 40 miles a day on average. I definitely got to 5,000 miles more quickly than I anticipated! My most common weekday use is getting to Sacramento for work purposes, and I routinely drive to the Bay Area (though I still prefer the train if the timing works out since I can work or read). I also have had a great time using the car for weekend trips (details below). I’m still very impressed with the performance, range, and general fun of the Bolt. I’ve found that people are very curious about the car, and now that I have an HOV sticker more people notice that my car in an electric vehicles (EV) and ask me about it. The number-one question I get is, “How do you know it won’t run out of charge?” My go-to answer: “How do you know your car won’t run out of gas?” The Bolt, like any car, tells you right on the dashboard how far you can go before you run into trouble.